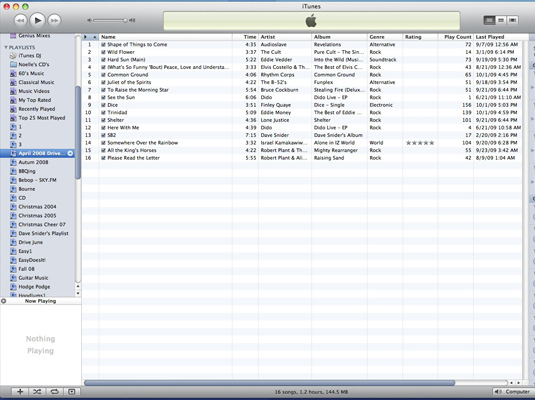 iTunes is the default media player that comes with Mac OS X Snow Leopard. Besides being a great audio player, iTunes is adept at creating CDs. iTunes makes the process of recording songs to a CD as simple as a few mouse clicks. Making the modern version of a compilation (or mix) tape is easier than getting a kid to eat ice cream. Audio CD: This is the typical kind of commercial music CD that you buy at a store. Most typical music audio CDs store 700MB of data, which translates into about 80 minutes of music. Data CD or DVD: A standard CD-ROM or DVD-ROM is recorded with the audio files. This disc can’t be played in a standard audio CD player (even if it supports MP3 CDs). Therefore, you can listen to these songs only by using your Mac and an audio player, such as iTunes, or a PC running Windows. MP3 CD: As does the ordinary computer CD-ROM, an MP3 CD holds MP3 files in data format. However, the files are arranged in such a way that they can be recognized by audio CD players that support the MP3 CD format (especially boomboxes, DVD players, personal CD players, and car stereos). Because MP3 files are so much smaller than the digital audio tracks found on traditional audio CDs, you can fit as many as 160 typical 4-minute songs on one disc. These discs can also be played on your Mac via iTunes. Keep in mind that MP3 CDs aren’t the same as the standard audio CDs that you buy at the store, and you can’t play them in older audio CD players that don’t support the MP3 CD format. Rather, this is the kind of archival disc that you burn at home for your own collection. Build a playlist (or select an existing playlist that you want to record). If necessary, create a new Playlist and add to it whatever songs you would like to have on the CD. With the songs in the correct order, select the playlist. Choose the Playlist you want to burn to CD. 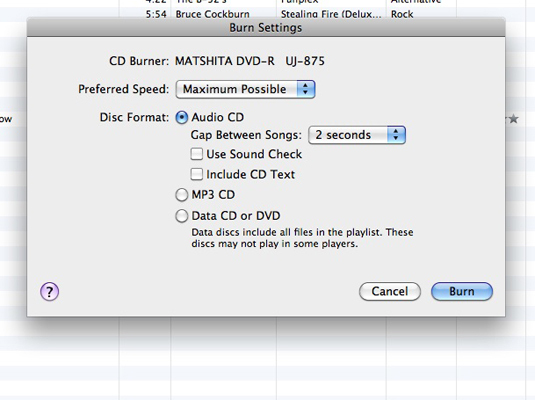 Click the Burn Disc button at the bottom of the iTunes window to commence the disc burning process. To save yourself from sonic shock, enable the Sound Check check box before you burn. iTunes will adjust the volume on all the songs on your audio CD so that they’ll play at the same volume level. Click the desired recording format (again, usually Audio CD) in the Burn Settings dialog that appears. iTunes lets you know when the recording is complete.